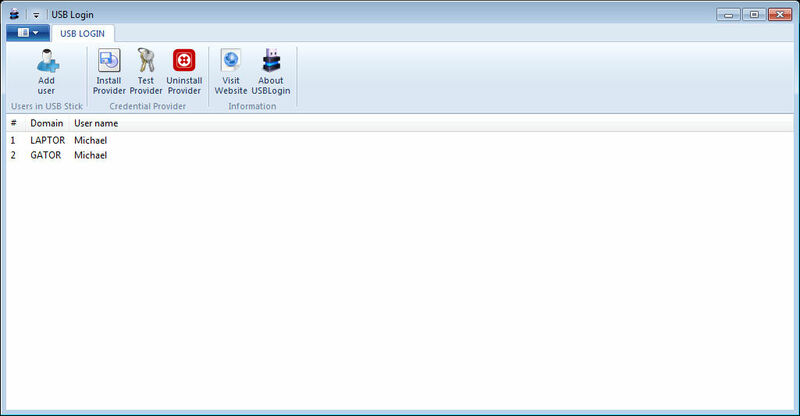 USBLogin - Login by plugging your USB Stick. Login by plugging your USB Stick. Only an administrator can install the USB Login Provider, and also only an administrator can edit credentials used for login to the PC. Any user can use the login provider to login. If the user wishes to add credentials to login to another machine, they can do it without admin privileges. USBLogin stores passwords in order to login. It stores the password in a secure way, but no storage method is 100% secure. Use at your own risk. USBLogin creates files in the USB stick related to the computer name and encrypts them using computer information. The file that is created in the stick is only readable from the computer it is created from, and even if you manipulate the file permissions to read the file from another computer, it will be useless since it is encrypted using information from the computer it is created from. USBLogin is portable. You can run it from wherever you want. It creates users and provider information in the system directories and it accesses your first available USB stick. Remember to read information and security considerations - USBLogin is a 2-way authentication mechanism, so your passwords are stored. Insert a USB stick, USBLogin should recognize the stick and detect it. The stick must not be read-only. Note that the passwords are stored in the USB stick in an encrypted way. If you lose your login ID (for example, if you reinstall Windows), the USB stick will be useless to login even if the credentials are the same. You must remove the credential file in the USB stick and create it again.